Dental Implants in Sarasota | Restore Your Health. Restore Your Smile. Dental implants are popular procedure for replacing missing teeth. Dental implants are highly rated for patient satisfaction and are preferred over traditional dentures because of their significant advantages. Dental implants incur many benefits such as a positive effect on function and appearance, bone health and density, as well as confidence. Dental implants are the versatile solution to replacing any number of missing teeth. Dentures are only recommended if many or all teeth are missing. Implants can be used to replace single or multiple teeth including full sets. Dental implants are comprised of titanium which is biocompatible which allows the implants to integrate with the jaw bone. Dentures however are made of acrylic, cast metal, and plastic. These materials are known irritants to the gums. Bioavailable titanium in bone implants fuses with the bone and forms a permanent bond. Using dental implants to replace missing teeth allows stability and security not found with traditional dentures. Denture wearers often complain about the sound and movement of dentures while talking, laughing, and eating. Dental implants preserve and stimulate bone at the implant site. Bone loss begins to occur when you have missing teeth. 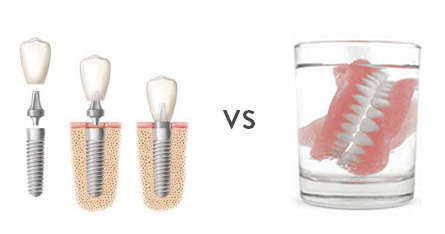 Implants replicate the presence of the tooth root which stimulates the bone at the site of the missing tooth. Dentures do not preserve bone mass in the jaw. Those who select dentures to replace missing teeth will be subject to the deterioration of bone which will advance over time. Dental implants do not require special treatment aside from good oral care and can last you a lifetime. However, dentures may need to be refitted or replaced over time as aging and bone deterioration change the shape of your jaw. Dental implants can last for a lifetime and are a long-term investment in your health. The majority of all patients are good candidates for dental implants replacing their missing teeth. However those patients who suffer from advanced bone loss may require bone grafting.